Bradford Bulls: Is professional rugby league in Britain booming or facing difficult times? Crowds are growing, income is improving and British rugby league is expanding to a new continent. But a leading sports historian believes the sport is facing difficult times. The reason? 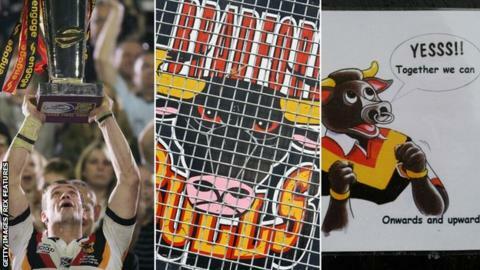 The demise and resurrection of the Bradford Bulls. According to professor Tony Collins, the club's fate is the sporting equivalent of a Greek tragedy that has turned into a watershed moment for the sport. Inside 10 years, the Bulls went from winning a third World Club Challenge, to relegation to British rugby league's second tier and finally liquidation on 3 January after entering administration for a third time in four years in November. A new Bradford side has since been installed in the city - headed by former New Zealand Rugby League chairman Andrew Chalmers and ex-Wigan coach Graham Lowe - and will begin the campaign with a 12-point deduction. "The Bradford crisis has thrown up huge issues for the sport," said Collins, a professor of history at De Montfort University who has authored a number of books on rugby league. "Bradford were a huge team and they have failed over the past few years despite the help and assistance given to them by the Rugby Football League. That has to put a question mark over how successful those measures were, both in terms of support they were given and in terms of punishments handed out and how useful they have been. "If you look at the recent years of difficulties, Bradford are probably to be seen as the equivalent of the Greek economy - no matter what they tried to do, they were burdened by debt. Similarly, with a 12-point penalty it is difficult to envisage them achieving anything on the pitch." The collapse of Bradford Bulls, among the most decorated British rugby league clubs in the past two decades, is one of the biggest sporting financial failures in recent years alongside the the liquidation of the former Rangers Football Club in Scotland in 2012 and Championship rugby union side London Welsh in December. Penalties on the new club "were not taken lightly", said RFL chief operating officer Ralph Rimmer. "What was important was that we moved quickly and decisively to ensure that any owner of a new professional club in Bradford was completely aware of what they were faced with for the 2017 season," he told BBC Sport. "There will be people who disagree with the penalties that we have imposed on the new club and they have valid and well-held arguments, but on balance, the independent board decided that it was in the best interests of the wider game that the new Bradford club began life in the Championship on -12 points." The RFL's handling of the now defunct Bulls and penalties to be imposed on its phoenix club have been criticised by sports finance expert, Rob Wilson. "Bradford is certainly a mess in every way, shape and form," said Wilson, a principal lecturer in sport business management at Sheffield Hallam University. "When Bradford first went into administration in 2012 it was not surprising; what was surprising was how the RFL responded to it, which was essentially to take away their TV payment, which made up about 60% of their revenue stream at the time. "You add two and two together - if this club is struggling financially and we now remove their major source of income as a penalty for struggling financially, they had no real options or real ability to improve their financial position, not at least in the short term. The successive administrations and changes of ownership have not been at all surprising." And now, Wilson says the club that has been reformed in West Yorkshire will "probably continue on a downward spiral". "This club was struggling financially, they will now do all they can to get semi-professional players in to play for this new club, so the quality of those players is likely to be lower than other teams in the Championship, meaning they will struggle on the field - and starting with a 12-point deduction is likely to lead to relegation anyway. "It makes it difficult for any Bradford club to make money and become sustainable given that sponsors tend to want to align themselves to success." The new team will be captained by former England and Great Britain star Leon Pryce, and despite a number of departures, they say they have 26 players signed up for the forthcoming season. Remaining in the Championship means Bradford maintains its long history in the game, with a rugby presence in the city since before the birth of Northern Union in 1895. Chalmers said the new ownership group - which initially tried to take the club out of administration - is "under no illusion of the enormity of the task" ahead of them and that it is their job "to win the trust of supporters and deliver a club that they are proud of". Rimmer, from the RFL, added: "The announcements made by the owners of the new club suggest they have the vision and belief to take the club forward and that is now their complete focus." The group now in charge of Bradford will need to financially support the side for three years - a point the RFL stressed when the initial requests for tenders was put out following the winding-up of the Bulls. Wilson said financial stability is "the number one issue of importance" in professional sport. "If you get that financial position right, you can build and your sporting success and sporting performance will improve naturally as a consequence of that," he said. "Achieving that over the next three years, I think, is a fundamental objective. Whether they can achieve that with their potential relegation into League One is another matter. "Less revenue, less money coming in, you still have your expenses for your players and it becomes this vicious circle. "It is very much a downward spiral at the moment, which manifests the problems in rugby league in regard to financial positions in a tangible way." The repeated failing of the Bulls, a club largely credited for the success of the Super League summer-era - winning four titles in nine years from 1997 to 2005 - is a situation that Collins says reflects poorly on the game's governing body. But it is also a tale of a club crippled by its own over-ambition. "Bradford will be looked back on as Icarus," said Collins. "They put everything into being world champions, as they were in the 2000s, and ultimately it was that success that destroyed them. They flew too high and got burned." Collins believes the incoming club's hopes of returning to those same lofty heights are not impossible, but their immediate future will remain complicated. "In the short term it is going to be a tremendous struggle on the field for them. "In the long term, I don't know much is going to change. If you look at the residual strength the club in the city and its position in rugby league, then there is nothing to say that they won't be a leading club again within the next decade." Professional rugby league clubs, by their very nature, are unlikely to learn from Bradford's collapse as they chase glory of their own, says Collins. "The history of rugby league, and probably professional sport, is that they live for the moment," he said. "Clubs live for success and if they get success, they want it tomorrow at the latest. Long-term planning has not traditionally been a feature for the game." But Collins says the RFL should consider re-evaluating a number of aspects of professional rugby league in the United Kingdom - many of which played a part in Bradford's demise. "It would be a great opportunity to look at the structure and finances of the game, to look at things like salary cap, the way in which clubs are financed, the allocation of TV money and things like that. "Whenever a business or sport goes through a crisis like this, it is always a good opportunity to sit back and reflect and reassess what you are doing. That, as well as a re-solidified Bradford club, would be best thing to come out of this mess." Roger Draper, chief commercial officer and Super League executive director at the RFL, said the sport will benefit from lessons learned. "Are there still things that we can improve on? Absolutely," said Draper. "Do we need to listen to what our fans want and react to that in a changing and challenging world? Absolutely. But we are confident we will do that and we will continue to grow the sport and keep it moving in the right direction." Figures provided by the RFL indicate financial growth and rise in interest in the professional game in Britain - with annual Super League commercial income rising 50% from 2014, with distribution of funds to Super League clubs also up 50% since 2013, while average TV viewing figures and match attendances are also up. In 2017, rugby league becomes the first British sport to expand across the Atlantic with the Toronto Wolfpack joining League One - the third-tier of the professional game - and reportedly agreeing one of the biggest rugby league sponsorships in the northern hemisphere. Draper said: "The last couple of years have seen the professional game grow both on and off the pitch. Average attendances across the Super League are around 10% more than in 2013, more people watched Super League games on Sky Sports in 2016 than they did the previous year and our commercial income has risen by 50% since 2014." However, Wilson, co-author of academic paper 'Staring into the abyss? The state of UK rugby's Super League', believes clubs throughout rugby league's professional system are "battling on a day-to-day basis". In 2013, Wilson was part of a BBC Inside Out investigation that alleged Super League clubs faced combined debts of £68.5m and that there was a huge financial disparity within the competition - having looked at the balance sheets of 11 of the 14 top-flight clubs at the time. Research into the financial state of Super League clubs between 2006 and 2012 led to the conclusion in the paper, published last year, that "rugby league needs to produce a sustainable business model and if it does not, its clubs, and in turn the sport, will die". "More than 50% of clubs operated hand to mouth. Money that comes in from matchday receipts, broadcasters and sponsors was essentially being spent immediately on running costs of the clubs," he added. "You have this crazy situation in professional team sport where hand to mouth existence seems to happen and clubs, which really would have gone into administration or closed down if they were a normal business, are able to survive by a bit of handout or generation of revenue from somewhere. "We will see more clubs own up to financial problems over the next couple of years, whether we will see another Bradford situation is difficult to predict." Bradford's fellow Championship side Sheffield Eagles admitted to a "dire financial predicament" and were on the brink of going out of business at the end of last season. They have since relocated home games to Wakefield, 30 miles away, after failing to find a suitable ground in their own city. Relegated Cumbrian sides Workington and Whitehaven are also both struggling financially. Wilson said that the recent restructure of the professional game in Britain, with the re-introduction of promotion and relegation in 2015, "may lead to an improved financial position", but added that "only time will tell if it works".